STOP and GLOW Mobile Spray Tanning - Mobile Spray Tan Service in West Chester, PA | We Bring the Spray Tan to you! STOP AND GLOW is a mobile spray tan service operating in West Chester, PA and surrounding areas in Chester County. We provide a convenient, professional service using only organic, eco-certified spray tan solutions that are safe for your skin. From a light glow to a dark, rich bronze we have a shade that will compliment your skin tone. Each spray tan is custom to contour your body for the best results. Don't risk your health with UV tanning or get a streaky tan from a spray tan booth. We are the top choice for a professional grade spray tan that is guaranteed to look flawless. Whether you're a stay at home parent or a professional on the go, we bring the spray tan to you at a time that fits your schedule! Call, text, email or submit a contact form to schedule a spray tan. We suggest contacting us in advance from your requested date to secure the date and time. Click below and submit a contact form with your information and/or questions. Please be sure to include the preferred date of your spray tan appointment. A representative will confirm you're appointment via email, text or phone. If the requested date is not available we will do our best to offer a date and time as close to the one requested. If your dates are not flexible we urge you to book in advance. We do require a $20 deposit to hold your appointment. You can make your spray tan deposit here. The night before your spray tan is the night you will prep. It's very important to exfoliate the night before and make sure you avoid moisturizers and skin additives the day of your spray tan. Please read our Spray Tan Prep and Spray Tanning Tips pages for step by step instructions on how to achieve the best results from your spray tanning session. Our spray tan technicians will arrive at your home, or requested meeting area, on the day and time of your appointment. We will need a designated area to set up a 6' tall tent and an wall outlet to plug in our spray tan machine. We supply the rest and in under 30 minutes you will have a beautiful glow without leaving your home! It's time for you to leave the tanning bed for a safer tanning alternative! STOP AND GLOW Mobile Spray Tan provides custom sunless tans in West Chester, PA and surrounding areas including but not limited to Downingtown, Malvern, Chester Springs and Exton. Our in home airbrush tanning service is fast, convenient and professional! We specialize in single client sessions, multi-client sessions, spray tan parties and wedding parties. Our spray tan technicians use premium Norvell organic spray tan solutions which is a trusted, well known brand within the sunless tanning industry. We guarantee you will be amazed with the results! We strive to provide our clients with an enjoyable, convenient and reliable service that will change the way you tan. 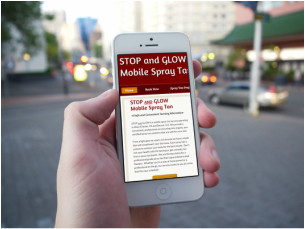 STOP AND GLOW provides a mobile spray tanning services to West Chester, PA and surrounding areas in Chester County, PA.
​Click here to see if we service your area. View our pricing menu ranging from an individual client session, multi-client session, spray tan for weddings, spray tan packages and sunless tanning products. Click below for details. Preparation for your spray tan is key! Take the time and use the right Norvell Sunless products to prepare and care for your spray tan and you'll be amazed with the results. Our spray tan blog is full of information from sunless tanning product reviews to tips for achieving a flawless spray tan. Visit our blog to find the information you need to know before your spray tan session.